I am beginning a new series exploring mine (human’s) relationship with the natural environment. It is a long way to go before it is a series but I thought I would share with you one of the first pieces. Your feedback and responses are welcome. Thank you for your encouragement, I am intrigued also how it will turn out, the process can give you surprises. Also, working with a poet for the recent Colab exhibition in Bendigo was a revolutionary experience for me and her poem got me to a tee! Inspiring me to delve deeply. 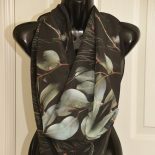 Hi James, the piece was made in order to display my wearable art, silk scarves particularly, and by doing so referencing the bush where I work in. So far I have made three forms, each made from my handmade,paper. The,paper is dyed with flora such as eucalyptus leaves and other native flora that I collect. I also add pieces of flora in the paper making process. As I have been working on these forms the desire to explore my reasons why and how I am creating my art has been in my mind. And so I now am planning on using the forms as pictured here and also combining them in various ways with the scarves and myself, in a more ethereal way, both in the bush and in studio. Thank you for detailing the process your art is undergoing. Wonderful to know these aspects Sharon, and I can see how this works beautifully not only as a means of displaying your work but as an extension of it. It is hard to incorporate and assimilate the human element in the Australian bush and this is a very eloquent way of approaching the problem. All the best with the project! Hi Sharon, this is intriguing; can you tell us more about the project? Is it sculpture, or is it installation made specifically to be photographed? This entry was posted on September 15, 2018 by sharongreenaway in #sharongreenaway and tagged FLORA; NATIVE; INDIGENOUS; BENDIGO; AUSTRALIA; FLOWERS; IN SITU; SHARONGREENAWAY; ART; FLORAL ART; BEAUTY; NEAR HOME; RETURN TO THE BUSH; DUMMY BUSH; GHOST; ETHEREAL; FROM WHERE WE CAME; HOMAGE TO NAT.